BlackBerry Curve 8910 Pics | BlackBerry Blast! It looks like RIM is replacing those pesky little trackballs with new trackpads on all their devices. 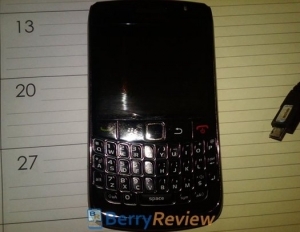 This looks like a BlackBerry Curve 8900 with a new trackpad. The new BlackBerry 8910 as its called runs OS 5 and is much like the 8900, but with the trackpad. BerryReview got its hands on this first picture of the new Curve.